Does Nikon’s latest professional 70-200mm justify its price? 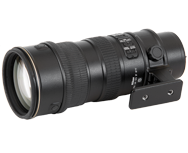 Nikon’s flagship medium range telephoto lens the Nikon AF-S NIKKOR 70-200mm f/2.8G ED VR II offers a versatile focal range, great features and top-class optical quality. Costing $2,400 it’s an expensive option however, and notably with cheaper alternatives like the Sigma 70-200mm f2.8 EX DGH APO HSM II and Nikon’s latest f/4 version, the AF-S Nikkor 70-200mm f/4G ED VR now on the market, is this top-of-the-range lens worth the extra money? The zoom range 70-200, or thereabout, is one of the real classic lenses, an absolute “must” for sports and photojournalism. The faster the maximum aperture the better, but most important of all it must be a good performer. Tamron’s SP 70-200mm f2.8 Di VC USD has the right specifications and a price tag that is very attractive, especially when you see how good it is. Launched in October 2012, this new lens from Nikon offers a lower cost entry point to the very popular 70-200mm focal length that finds a wide range of uses in everything from sports and wildlife to portraits and social documentary photography. Taking on many of Nikons newest technologies, does the reality match up to the promise? Today we are publishing the test results of the Sigma 70-200mm f2.8 EX DG APO Macro HSM II (mounted on Canon and Nikon bodies), as well as comparing its performance relative to equivalent lenses on the market.